I was a little nervous about The Gala Dinner, following the sumptuous lunch – I wondered if I’d be able eat anything after gorging myself of the 8 or so courses, with wine, that we enjoyed so much at lunchtime. However, I couldn’t seem to be unappreciative, so I made a big effort! Such dedication! Well it wasn’t hard – the dinner was excellent at Restaurante Pedro Marín, Caravaca de la Cruz, which is a 2o minute coach journey from Bullas. Top quality amuse bouches and again several courses. Needless to say the wines were several of those which we had been ‘blindly’ judging during the day – and there were plenty of them! Coincidentally I was seated at the same table as Señor Alfonso J. Garcia (and his charming wife) who won two of the Gold Medals – he owns and makes the wines for Bodega Monastrell, www.bodegamonastrell.com. You’ll see his Golds below and there is no doubt in my mind that these wines would also merit medals in the worlds oldest International Wine Competition, the International Wine & Spitits Competition (www.iwsc.net). Indeed, I’ve encouraged Alfonso to enter this year’s competition. Success in the IWSC is really meaningful, but not just for the bodega concerned, also for the DO. Let’s face it DO Bullas, is not the first Spanish wine producing area that comes to mind, and yet there is real quality here. Wines that compete with those from the better known areas in Spain. Wines that really deserve consumers’ attention. Some further reflections of the DO Bullas Annual Wine Competition will follow in the next few days. Well, I’m now back in my room – recovering! What a day, so far! This morning the Judging Panel convened at 10:00 hrs in the Museo del Vino, Bullas – and got to work. 44 wines were tasted in a four hour period, with a 30 minute break. Each judge marked the wines and their scores were collected throughout proceedings, fed into a computer and collated. The results – in other words the medal winners will be announced this evening at the Grand Gala Dinner in a top quality restaurant in a nearby town, and the medals will be presented! It’s been an honour to be a part of it all – in fact the only foreigner on the tasting panel which included winemakers, writers critics and esteemed and famous media personalities. We’ve just finished an excellent lunch, luckily for me at the same Casa Rural where I’m staying, courtesy of the Consejo Regulador, DO Bullas. I think 8 courses, or was it nine(?) were presented and each was accompanied with at least one different wine, often two or more. And the quality of the wines? Well, I often wonder if I’m being harsh when awarding points and therefore ultimately medals, or not. Am I operating as if I was on the IWSC (International Wine & Spirits Competition – the oldest in the world and one of the most prestigious) Spanish Panel (which I will be, next month) and applying their strict interpretation of what is, and what isn’t, quality, when it comes to wine? And if so, is this the correct way to go about judging local wines? Well, yes, I think it is correct to apply the same quality control rules. If a wine entered for the IWSC wins a medal, you can be sure that it deserves it! Can we say the same about all other competitions, well no – frankly. So when I judged the DO Bullas wines I applied the same stringent tests. I found just 2 gold medal winners, a few more silvers, perhaps a few more bronzes, quite a few ‘nearly wines’ and a couple of poor or perhaps faulty wines. I’ll be interested to see how my colleagues rated the wines tonight at the celebratory dinner where I’ll see if more Golds were given etc. More tomorrow – again, when I’ve recovered! Well, I was back in time to write the 2nd half of yesterday’s blog, honest, but there were internet connection issues! Plus, for some reason my laptop is telling me that the photos I took, with my usual camera, are too large for this blog! Shame as I took some good ones last night at the Inauguration of the VIII DO Bullas Wine Competition, and of the tasting that followed! I have to admit to thinking it, although most enjoyable, a little odd that the wine judges of a wine competition taste the wines entered the evening before the event. Thus there could be some of us who will have an idea already, before this morning’s competition, about which wines will be the medal winners. Of course, tasting this morning will be blind, whereas it certainly wasn’t last night. So, maybe this tasting (and judging, of course) should best be termed, a translucent tasting rather than a blind one?! Never mind, I’m up for it – in every possible sense. Showered, dressed and writing this update before i go down to breakfast. I didn’t taste all the wines last night, of course – though I did taste all the whites (not many, it’s largely and red wine area) and all of the rosados (there were more of these, mostly using the favoured grape variety, Monastrell, but with bit parts also for Garnacha too. 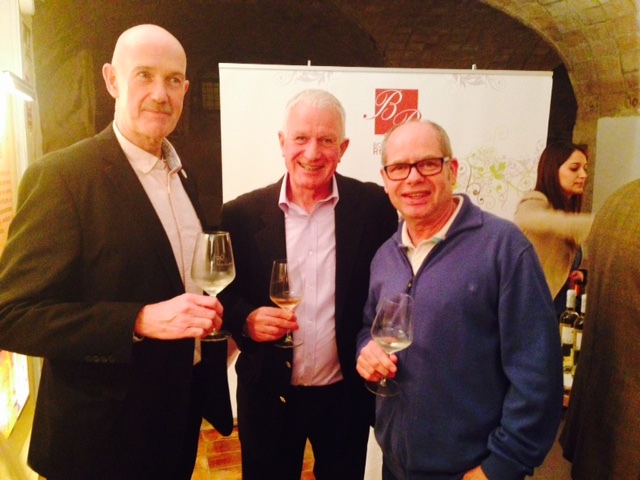 My friends, Nigel, a resident of Bullas, and Pepe, one of my fellow Judges, enjoying the wine tasting before ‘work’ in the morning! The predominant colour of the rosados was the bright pink that is common here, with variations on a theme, though one Provence style, onionskin-coloured rosé stood out as it was so different. (Therefore we’ll know whose this wine is when we taste ‘translucent’ this morning!). I left a little early, conscious that I’d be ‘working’ this morning, so I didn’t have the chance to visit all the stands for their reds. However, I can say that there really were some outstanding red wines there last night, so I’m looking forward to tasting more tonight – and the same ones again! Well, yes, but with one exception – one of the exhibitors last night, and one of the best red producers, has not entered this morning’s competition. No controversy, nothing unpleasant, they just took a management decision to exhibit, but not to enter. I’m not really sure why, it’s a shame as I’m certain they’d be amongst the medals! Lovely atmosphere, super wines and tasty, gourmet nibbles too. Now down to work! So, here I am in a rather quaint Casa Rural, five minutes from Bullas, preparing for this evening’s entertainment, prior to judging tomorrow’s DO Bullas Annual Wine Competition. I’m looking forward to it immensely. Hospedería Rural El Molino de Abajo http://www.castillico.com/hospederia.php. The Casa Rural above is one of the member Hotels/Casas Rurales in the DO Bullas Ruta del Vinos @RutaVinoBullas and the bucolic, converted water mill is atmospheric and comfortable. Tonight there is a wine tasting where invitees will be able to sample an array of quality wines from all the producers operating under the auspices of DO Bullas, as well as having the opportunity to chat with winemakers. It will be held 5 minutes away from where I’m staying, in the Museo del Vino, which is the most pro-active, dynamic Wine Museum I’ve come across here in Spain. Bravo! I was disappointed to note that in Dia Supermarket opposite the Museum I could not see a single DO Bullas wine, and this in the heart of Bullas! Shame on you Supermercados Dia! There are some excellent wines made here, across the full price spectrum so there really is no excuse! Local wines deserve representation! As I’m judging in the morning I’ll need to keep a clear head tonight, so I should be back at the Casa Rural in time to add to this on-going blog. We’ll see! ANOTHER SPANISH WINE PRODUCING AREA IN DISARRAY! I’m a worried man. Should I be? Am I overreacting? Is that how you spell ‘overreacting’, double ‘r’? See, I’m a nervous wrreck! I’ve just heard that there is serious discontent in one of my favourite wine producing areas, DO Valdeorras, in Galicia, NW Spain. White wines made with the area’s indigenous grape variety, Godello, for me, easily rival those made with Albariño in neighbouring DO Rías Baixas. I’ve been same so for years and have been most gratified during the last couple to see that my far more illustrious wine writing colleagues and Masters of Wine have concurred. 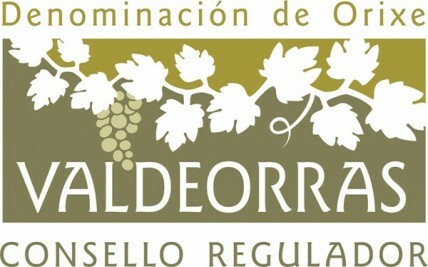 However, according to Decanter Magazine, the Chairman of the Consejo Regulador, the Regulating Council, has just resigned in a dispute about the grape harvest. Señor Luis Garcia Pando has accused some producers, particularly the co-operatives, of deliberately promoting higher yields than the maximum allowed by the DO. The inference being that the more grapes produced the more wine will be made, but of a lesser quality. The extrapolation of this concern is that the good (in my view, excellent!) reputation of DO Valdeorras would be damaged. Needless to say the producers concerned have strenuously denied this and, supported by the agricultural unions, they have forced a vote of ‘no confidence’ which in turn forced Señor Garcia to resign. There seems to have been a technical argument used to support their case, as Señor Garcia had threatened to take the offending producers to court, which they argue is beyond his terms of reference. However the basic point, re over production damaging quality does not seem to have been addressed. There has thus been a schism created between member bodegas: those who support Señor Garcia argue that they are concerned about the quality of wines produced in DO Valdeorras; those opposed deny the accusations saying also, “ . . . no-one would doubt the quality of Valdeorras, even with more grape production.”. Both sides have an agenda. It seems to me that those who support the now ex-Chairman, Señor Garcia, have a wholly visible goal – to maintain the quality of DO Valdeorras wines. Whereas the agenda of those who oppose them is loosely hidden. Growers, presumably members of the agricultural unions, are paid per kilo of grapes. More grapes, more money. And their tag-team partners, the co-operatives, want as many grapes as they can find in order to make as much wine as possible to sell to, an as yet, unsuspecting public. The first steps on the slippery slope to a quality downgrade have already been made. It would appear that the naysayers have been hiding their heads, not in sand, but in the slate-strewn soils of DO Valedorras, and therefore not paying attention to what’s been happening in: DO Navarra, DO Binissalem-Majorca; DO Rueda, DO Cava, DO La Mancha, and the latest, DOCa La Rioja? In all the above DOs there have been problems, mostly different from those facing DO Valdeorras, but some similar. All have resulted in bodegas, often famous names, abandoning their respective DOs (with the exception so far of DOCa La Rioja which has recently convened a meeting designed to placate the unhappy bodega(s?) concerned, the result of which is not yet known). And the result of this small, sometimes larger (e.g. DO Cava) exodus from the DOs above? Well collateral damage has been done to the DOs and their faithful members. The ‘no smoke without fire’ proverb holds sway and consumers have been influenced. It’s been something of a PR disaster and even regional Governments have become involved with a view to damage limitation. And what of those bodegas that have deserted the sinking(?) ship? Well, there has often been a very pro-active publicity campaign, where bodegas have diplomatically side-stepped awkward questions from the press, whose answers could have poured scorn on the Consejos Regulador concerned. Most have publicly been at pains not to criticise the DOs, preferring to promote their new and different status – though who knows what has been said behind the closed doors of the Consejos Regulador offices! And finally, what of we consumers? Am I right to be worried? What are the portents of these small cracks in the solid fabric of several of the official wine producing areas of Spain? Will others follow suit in further zones? How will it affect you, and me? Will Spain eventually become ‘New World’ and abandon all the red tape, rules and regulations that simply don’t exist in countries such as USA, Australia, New Zealand etc? Is this the first chimes of the death knell for the structure of the Spanish wine world? Well, we can still buy wines and sparkling wines from those bodegas which have left their respective DOs. Indeed, it could be argued that such wines will be better than they were when made under the auspices of the DO as the bodegas concerned will have to make that much more effort in order to re-establish themselves. But what about the DOs from whence the deserters came? This is my worry. The bodegas which left, clearly had some problem with the DO, or the DO rules etc. These problems are not always clear and in fact may not affect us much? However, in the case of DO Valdeorras, I am worried for sure. The growers’ spokesman’s apparent affirmation (he can’t mean it, surely?) that more grapes will not harm quality, just doesn’t stack up. Has this guy never heard of green pruning (where vines have some of their forming bunches pruned to ensure fewer, but richer, grapes per vine)? Is he not aware of the fact that grapes, used for certain wines, which are harvested from old, less productive vines is a selling point? At this moment in time, I love the dry white wines made with Godello (and others) from DO Valdeorras, but I wonder how long my affair will last?